49 cards. Numbering picks up from where the 1990 Leaf Baseball set left off. #/99. 528 cards. #/20. Cards are original 1990 Leaf Baseball cards with a foil stamp added. 70 cards. Numbered to player's jersey number. 2012 Leaf Memories Baseball celebrates 1990 Leaf Baseball, one of the sets credited for pushing the limits of production values as the hobby began to soar. This throwback set not only pays tribute to the original, but it expands it with several modern spins. 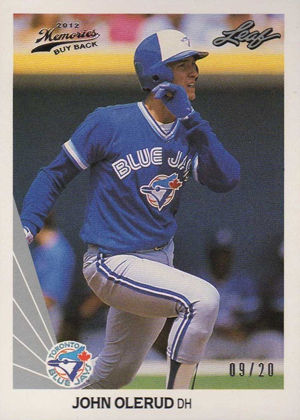 The entire 528-card 1990 Leaf base set returns with foil-stamped buybacks. They come in three levels, numbered to 20, 5 or 1. A 49-card expansion set picks up where the original numbering left off, adding new players to the mix. The cards mimic the original set's design. The checklist includes current players, prospects and legends. All are numbered to 99. Collectors can also look for Printing Plates. 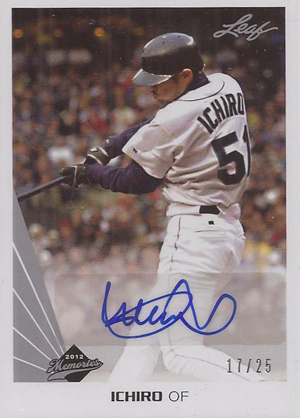 The base set also has an autographed parallel. 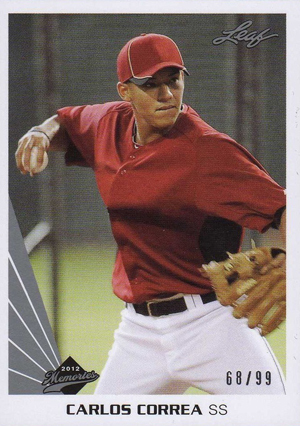 Numbered to 25, cards use sticker autographs. Players include Albert Pujols, Ichiro Suzuki, Carlos Correa, Jorge Soler, Reggie Jackson, Tommy Lasorda, Pedro Martinez and more. A total of 70 players from the original 1990 Leaf set have signed buyback autographs. All are numbered to the player's jersey number, resulting in some extremely low print runs. 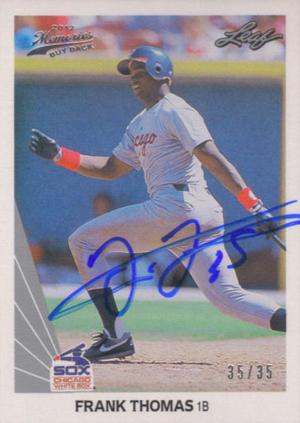 Among those signing are Frank Thomas, whose rookie card is one of the most iconic cards of the era. Other signers are Nolan Ryan, Cal Ripken Jr, Randy Johnson, Greg Maddux, Rickey Henderson and Jose Canseco. Fernando Valenzuela, a player who rarely signs cards, is also on the checklist. Leaf plans to continue with more 1990 Leaf buyback autographs in future sets. The ultimate goal is to have all living players sign in some form. 2012 Leaf Memories Baseball boxes have ten total base cards and stamped buybacks. They also come with two autographs. The product has a very low print run of 155 ten-box cases. I pulled a Luis Aparicio auto’d printing plate, looks nice!